A senior member of the Iraqi National Guard is in custody after being arrested for suspected links with insurgents, the US military has said. Gen Talib al-Lahibi, in charge of security for Diyala province north-east of Baghdad, was detained on Thursday. He was appointed to the post only a week ago. The Iraqi National Guard is recruited and trained by the US, which is attempting to build up a local force able to ensure security in the country. "Lahibi was detained by multinational forces on 23 September for having associations with known insurgents," a US military statement said. 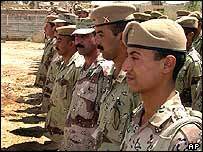 Gen Lahibi, who served in Saddam Hussein's army, is the most senior member of the new Iraqi security forces to be detained on suspicion of collaborating with militants. He commanded three battalions in the area around the town of Baquba. The US appointed him last week after he had been nominated by fellow guardsmen to replace his predecessor, who was assassinated in August. Baquba, 65km (40 miles) north-east of Baghdad, has been a frequent flashpoint for clashes with militants. Gen Lahibi's arrest underlines the difficulties the Americans have in building up an Iraqi security force able to take over from US soldiers, reports the BBC's Caroline Hawley from Baghdad. There are no shortage of recruits but that is mainly because there is little other employment and the Americans know they cannot always count on their loyalty, she says. There are now 30,000 members of the Iraqi National Guard across Iraq, in addition to 80,000 police, according to the US military. But they are poorly trained, poorly equipped and some do not even have proper uniforms. They are also subject to daily attacks. Recruitment centres are frequently targeted by suicide bombers. Many members of the new force now travel to work in civilian clothes to hide their job from their neighbours after receiving threats to their families. If the allegations again Gen Lahibi are true, it would not be the first time members of Iraq's security forces have joined ranks with the insurgents. There are no precise figures but police and national guardsmen deserted in droves in April, reluctant to fight fellow Iraqis.